"A refreshingly new approach toward improving use-case modeling by fortifying it with aspect orientation. "-Ramnivas Laddad, author of AspectJ in Action "Since the 1980s, use cases have been a way to bring users into software design, but translating use cases into software has been an art, at best, because user goods often don't respect code boundaries. Now that aspect-oriented programming (AOP) can express crosscutting concerns directly in code, the man who developed use cases has proposed step-by-step methods for recognizing crosscutting concerns in use cases and writing the code in separate modules. If these methods are at all fruitful in your design and development practice, they will make a big difference in software quality for developers and users alike. 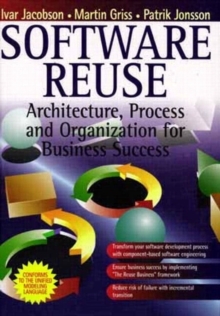 -Wes Isberg, AspectJ team member"This book not only provides ideas and examples of what aspect-oriented software development is but how it can be utilized in a real development project. "-MichaelWard, ThoughtWorks, Inc."No system has ever been designed from scratch perfectly; every system is composed of features layered in top of features that accumulate over time. Conventional design techniques do not handle this well, and over time the integrity of most systems degrades as a result. For the first time, here is a set of techniques that facilitates composition of behavior that not only allows systems to be defined in terms of layered functionality but composition is at the very heart of the approach. 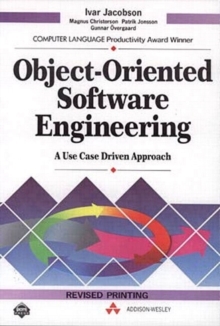 This book is an important advance in modern methodology and is certain to influence the direction of software engineering in the next decade, just as Object-Oriented Software Engineering influenced the last. "-Kurt Bittner, IBM Corporation"Use cases are an excellent means to capture system requirements and drive a user-centric view of system development and testing. This book offers a comprehensive guide on explicit use-case-driven development from early requirements modeling to design and implementation. It provides a simple yet rich set of guidelines to realize use-case models using aspect-oriented design and programming. It is a valuable resource to researchers and practitioners alike."-Dr. Awais Rashid, Lancaster University, U.K., and author of Aspect-Oriented Database Systems "AOSD is important technology that will help developers produce better systems.  Unfortunately, it has not been obvious how to integrate AOSD across a project's lifecycle. This book shatters that barrier, providing concrete examples on how to use AOSD from requirements analysis through testing. "-Charles B.
Haley, research fellow, The Open University, U.K.Aspect-oriented programming (AOP) is a revolutionary new way to think about software engineering. AOP was introduced to address crosscutting concerns such as security, logging, persistence, debugging, tracing, distribution, performance monitoring, and exception handling in a more effective manner. Unlike conventional development techniques, which scatter the implementation of each concern into multiple classes, aspect-oriented programming localizes them. Aspect-oriented software development (AOSD) uses this approach to create a better modularity for functional and nonfunctional requirements, platform specifics, and more, allowing you to build more understandable systems that are easier to configure and extend to meet the evolving needs of stakeholders. 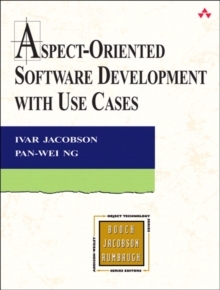 In this highly anticipated new book, Ivar Jacobson and Pan-Wei Ng demonstrate how to apply use cases-a mature and systematic approach to focusing on stakeholder concerns-and aspect-orientation in building robust and extensible systems. Throughout the book, the authors employ a single, real-world example of a hotel management information system to make the described theories and practices concrete and understandable. The authors show how to identify, design, implement, test, and refactor use-case modules, as well as extend them. They also demonstrate how to design use-case modules with the Unified Modeling Language (UML)-emphasizing enhancements made in UML 2.0-and how to achieve use-case modularity using aspect technologies, notably AspectJ. Key topics includeMaking the case for use cases and aspects Capturing and modeling concerns with use cases Keeping concerns separate with use-case modules Modeling use-cases slices and aspects using the newest extensions to the UML notation Applying use cases and aspects in projectsWhatever your level of experience with aspect-oriented programming, Aspect-Oriented Software Development with Use Cases will teach you how to develop better software by embracing the paradigm shift to AOSD.